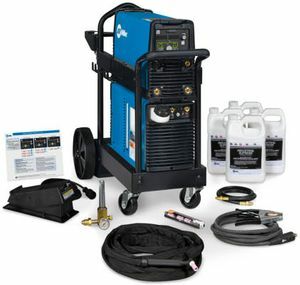 Miller Dynasty® 210 Complete With Foot Control is a water-cooled, 210 amp, AC/DC TIG welding package that comes with everything you need to start welding (except welding wire and shielding gas cylinder). The system features the Dynasty 210 CPS (Cooler Power Supply) with dedicated power receptacle for the included Miller Coolmate™ 1.3 water cooler. The Dynasty 210 complete package also includes 250 amp water-cooled TIG torch, gas flowmeter, gas hose, remote foot control, four gallons of torch coolant and a running gear with cylinder rack. What is the difference between dynasty 210 dx and dynasty 280 dx other than amperage? In basic terms the Dynasty 280 is a heavy duty version of the Dynasty 210. The 280 has a max welding amperage of 280 amps . The 210 has a max welding amperage of 210 amps. Most operating features are the same except that the 280DX has 2 additional features,Insight Core and Insight Centerpoint.These features monitor and report basic weld productively ,quality measures, and provides real time operator feedback and machine control. 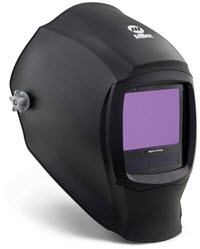 These features are basically used in production welding for quality control monitoring and supervision. The 280 can run on multiple voltages from 208-575 volt single or 3 phase. The 210 has the same multi voltage capability except it is limited on the high end to 480 volts .The 280 has a material thickness range in AC tig of .012-3/8" and in DC tig the range is .004-3/8". The 210 material thickness range in AC tig is .012-1/4" and in DC tig it is .002 -1/4".. Both machines can stick weld with common electrodes like 6010,7018,.. The 280 can be used for light carbon arc gouging .While the 210 cannot. Can the Trailblazer 325 EFI welder/generator run the Dynasty 210? What's the difference between the 951666 and 951668(except for the price:).